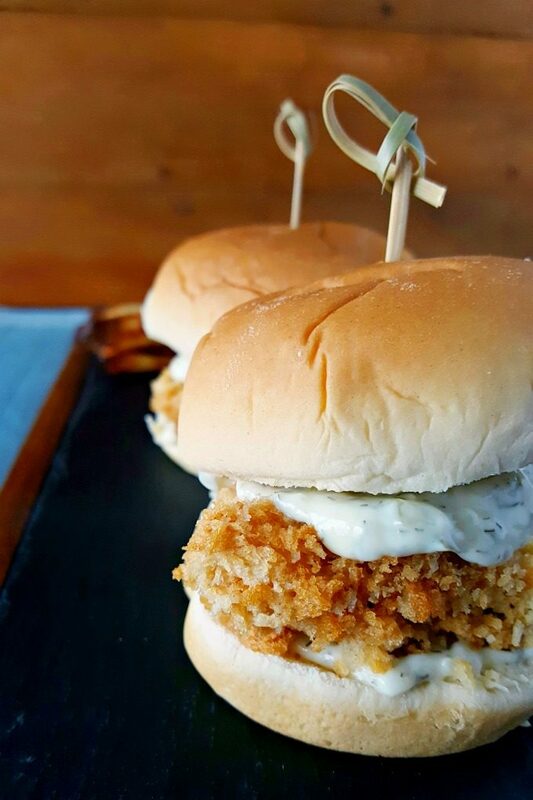 A craving for a fried fish sandwich inspired these super crispy, Oven Fried Fish Sliders. The crunch alone will get you addicted to these flavorful and healthier fish sandwiches. The big game is almost here! Are you excited? Not about game, but about the food!! ALL the food; the wings, nachos, potato skins. Then there’s everything Buffalo flavored like wings, cauliflower, chicken meatball sub, chicken bites, shrimp, tacos, pasta salad. I love Buffalo flavors together. The spicy and the blue cheese together just makes my mouth water. Now, getting ready for the big game is not the easiest thing in the world. ALL those wings, chips, dips, celery and carrot sticks. It takes a lot of time to make those finger foods and nibbles to watch. That’s why you need a barrage of easy recipes to get you through your party prep. I have to admit, we’re not huge fans of the big game. If our teams are in the game, then of course we’ll watch. But we’re not those types of people that watch it just because it’s the super bowl. And besides, it’s usually Sunday and it’s usually on late. We go to bed at 9. Anything on after that we just don’t watch. However, we’re not opposed to eating game day foods! I’ve whipped up a batch of wings or nachos for us while we’re watching the game. Guacamole and chips is a favorite dish of ours to nibble on. One of my personal favorites is corndog nuggets! Then there’s the sweet potato skins and potato crisps. Anything with potatoes goes on my plate without fail. These oven fried fish sliders came about due to my craving some good fried fish. You know what I’m taking about? That golden fried, beer battered, tender and flaky fish that is a party in your mouth. I’m drooling. But, the restaurant we were at didn’t have a fried fish sandwich. So, I opted for some burger sliders. Then it hit me. Why haven’t I seen fried fish sliders? Like, ever? Oh, I have to remedy that. And so, I did. But I didn’t want to do just your standard dredge for these babies. I honestly wanted to have that beer battered flavor. But, you can’t really just dredge fish in flour, then beer, then panko. It just doesn’t work. I tried. And failed. So, don’t do it. Then I thought about adding beer to the eggs and that just didn’t sound right at all. Then I thought about tempura. It’s a thin batter, or can be. I knew I was on to something with that train of thought. I’ve seen tempura batters that was as thin as lightly beaten eggs. Of course, off to Pinterest I went to see what I could find out about tempura batters and how they’re made. Nope, never made one of those, either. We don’t deep fry lots of stuff. Actually, we don’t really deep fry anything. I wanted the thinnest of tempura batters. One that barely coated the vegetables or meat. A batter thin enough so that you could see through it when the food was cooked because it didn’t make a thick layer of coating on them. After analyzing about 20 or so different recipes, I knew how I was going to tackle my dilemma. There were some recipes that were just flour. However, I knew that’s not the best way to go. You see, a good tempura is crispy and crunchy and light. That’s not usually achieved with just flour. You have to add cornstarch for that ultimate crunch. I add that to my eggs when I make French toast to get a nice and crispy outside with a tender inside. Cornstarch is a staple ingredient in all of my marinades for Asian recipes. It helps the meat brown really well when stir frying. Cornstarch is, without a doubt, not just a thickening agent, I’m here to tell you!! Most tempura batters call for some egg and water. I kept the some egg, but instead of the water, I added beer. No, it doesn’t really matter what kind. Personally, the cheaper the better because they usually impart that beer flavor that you’re looking for which I don’t find you get with more expensive beers. So, the opposite of wine is true; cook with what you don’t drink for better flavor. I have got to tell ya, sometimes my ideas are total fails. But times like? They’re pure genius. Honestly. If you’re craving some good, crispy, beer battered, fried fish, then this is the recipe for you. The flour prepares the fish to grab into all that beer wash goodness. That beer wash goodness prepares the fish for holding on to all that toasty, crispy panko goodness. While it’s not a batter coated fish, it still hits the mark for a good fried fish for me. There’s a super crispy coating on the outside. There’s that hint of beer flavor. And finally, there’s that tender and flaky white fish in the middle. 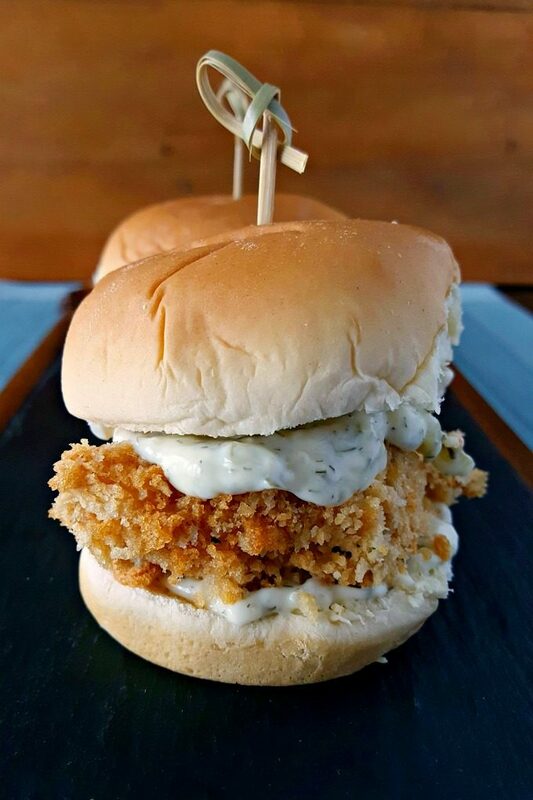 Now, all of this delicious fish goodness is then plopped onto a slider bun, topped with some homemade tartar sauce and served up with extra crispy oven baked fries. Oven fried? How can that be easy?? I have to tell you, they really are easy! Three bowls. A little mixing, a little dredging, and then you just bake them. How simple can that be? It can’t get any simpler. You’ll have a longer time trying to figure out what type of fish you want to use. Do you halibut or cod? Maybe you’ll try some grouper or monk fish. I’d say salmon, but I don’t like salmon. But if you do then go for it!! Just a few minutes in the oven and you’ve got crispy, juicy, delicious fish sliders to serve your guests. Top them with homemade tarter sauce and some pub chips and they’ll be happy game day guests. They’re applaud your genius for making fried fish sliders that are healthier than fried. These oven-baked fish sliders will vanish as soon as you set the plate down. They’re flaky and tender on the inside with a beer battered, crunchy outside. The tarter sauce is creamy and packed with flavors. And, the buns are your choice. I went with some slightly sweet potato rolls to serve these sliders on for dinner. The potato buns complimented the beer batter bringing its flavor out. I served mine up with some oven back, frozen fries. They have to be super crispy. You can’t have wimpy, soft fries to serve up with these sliders. There’s a bit of a debate about those air fryers. They look small to me. And I don’t think they don’t do anything my counter top convection or wall unit convection oven can do. It’s basically the same principle. Just need to have air circulate around the food. And the same goes with these sliders. They have to sit on a rack above the sheet pan. That way the air circulates all around these oven-baked fish sliders. That’s one of the tricks to keeping them super crispy. Make sure to visit the other bloggers participating in this week’s even! They have some delicious game day eats. Combine 1/2 of flour with the salt and pepper in a shallow. Stir with a fork until well blended. Combine the remaining flour with the cornstarch, egg white, and beer in a shallow dish. Stir with whisk until the flour and cornstarch are blended into the beer. Place the panko on a baking sheet and place in the oven. Toast the panko until golden brown. Allow to cool slightly before placing in a shallow dish. Using paper towels, dry the fish off. Dredge the fish in the flour, then dip into the batter, and then coat with panko before placing on a baking sheet fitted with a rack. Spray the fish with cooking spray (or use an oil mister) and bake the fish for 5 minutes. Turn the fish over, spray again, and bake an additional 5 to 7 minutes depending on the thickness of your fish. While the fish is cooking, prepare your buns with your sandwich toppings of choice (we used vine ripe yellow tomatoes and homemade tartar sauce mixing mayonnaise, some sweet relish, capers, dry mustard, and dill weed together). Serve with crispy baked fries. What a recipe! I was looking for a good fish burger recipe and this is simply stunning! In fact, I loved it so much I included it on my 10 most popular Pinterest summer recipes list! Hope you will check it out. I love that these are little bite-sized fish sandwiches. I really love fish sandwiches and yours looks perfect! Not to mention, healthier! I have to make these! 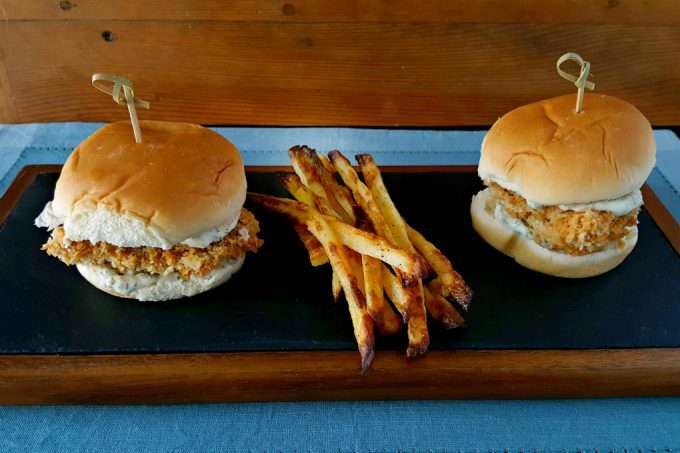 I love that they are sliders, but your technique sounds like you mastered it as no-fail, so I could totally maybe make baked “fried” fish work now! I didn’t know the love of cornstarch either- I think I knew it was used for tempura, but didn’t know it helped to brown things. Cornstarch is a magic ingredient most don’t use enough! I add it to my french toast batter to make it extra crispy on the outside, too. I love fish and chip and I sure won’t mind a delicious fish slider like this! It has been way too long since I have had an awesome fish sandwich. I cannot believe these are oven fried. They look ah-mazing!!! Thank you! Even the hubs said they were pretty darned good. I love this idea and a good fish sandwich! Looks so delicious! I seriously love making sliders for dinner and your crispy fish sliders are calling my name! YUM! I’ll be trying these with your homemade tartar sauce and soon! I haven’t seen fried fish sliders either, but now I want some! Yours look incredible. Love that panko breading. Thank you! The trick is to toast the panko. Mmm, I don’t instinctively think as fish (other than shrimp perhaps) as game day food but these tasty sliders might have me thinking differently! I figure any kind of slider is game day worthy. Even these fish ones! Move over Mickey D’s!! Your fish sandwiches look fantastic!! Thank you! I forgot the most important part! It’s 400.